Abstract: MSI offer up one solution to this search for performance at an affordable price in the form of the new FX5600-VTDR128 GeForceFX 5600 based videocard. Most of us cannot afford to spend $500 every six months in order to keep up with the latest high end videocard technology. Since we can't always get what we want, the real trick becomes finding the next best videocard at an affordable price. MSI offer up one solution to this search for performance at an affordable price in the form of the new FX5600-VTDR128 GeForceFX 5600 based videocard. With a retail price of $235 CDN ($167 US) the card comes with a whole slew of features, games, and is most importantly a decent performer. That's all well and good, but what separates the MSI FX5600-VTDR128 from the rest of the GeForceFX 5600 competition? Unlike many products out there, MSI actually include a good software bundle with their videocards for starters. 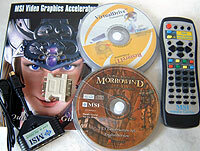 For example the FX5600-VTDR128 card comes with Morrowind, Ghost Recon, Duke Nukem: MP and a seven game demo/lite game CD. 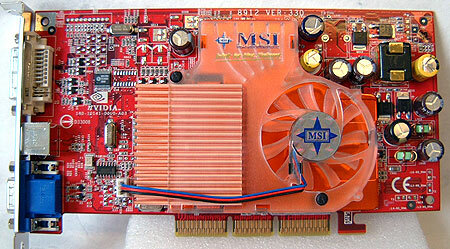 MSI have also included WinProducer/WinCoder, WinDVD, VitrutalDrive and RestoreIT! software. Things don't stop there, because the card is fully VIVO compatible as well. A VIVO break out box which supports both S-Video and Composite connectors is also thrown into the mix. With the breakout box is an infrared receiver which is used with the remote control which is also included in the package. Lastly, for those of you who use dual monitors, a DVI-to-analog converter rounds out the accessories. GPUs will always be increasing in clock speed, but one of the byproducts of all this speed is heat. Manufacturers are having to resort to larger and more powerful heatsinks to cool down their chips and this has resulted in noise going up substantially. If the consumer complains loud enough the manufacturers eventually listen, and so that's why we now find virtually all videocards equipped with custom built coolers which are quiet-running. MSI's "T.O.P. Tech cooling" runs with less noise that their previous cooling solutions. While I cannot confirm if the videocard is running cooler, I did notice that the card does run much quieter (MSI claims it only generates 28db of noise) then most other videocards. These days it's possible for one to update the firmware of a videocard which in turn could unleash a bit more performance. Of course, flashing a videocard is as risky as flashing a motherboard but MSI remove some of the risk by equipping their FX5600-VTDR128 with two BIOS! On a side note, we had a hard time getting the MSI FX 5600-VTDR128 to work well with our Granite Bay/P4 2.8 GHz processor test system. The driver would install but we'd always get a "not enough resources" error in device manager. At first we thought that the card was defective, but we saw the exact same error with two other GeForceFX 5600 videocards from different manufacturers. After some frustrating troubleshooting, we found that if DMA transfer mode on the HDD's was disabled the videocards would work flawlessly. With it enabled and the videocard simply refused to work properly. Up next, the overclocking adventure you've been looking for.